St Faustina and the message of Mercy. If you really love someone and they refuse to believe you love them or reject your love for them then you feel alot of pain in your heart. No matter how evil a person is the Heart of Jesus still Burns with infinite Love for them but His Heart is pierced by thorns caused by our sins, ingratitude and by so many people who do not believe He Loves Them. The heart of Mary burns with love for us too because her Son died for us. 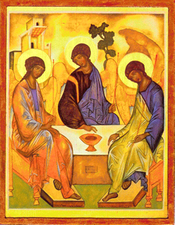 The word Trinity comes from the two words: Three and Unity. This name for God is not in the Bible but was made by the early Catholic Church to show that Christians believe that there is only One God but that the One God is Three Persons who are a single Unity and that each of the Three Persons is the One God. God is One Infinite Being but He is Three Divine Persons. So if we asked a Muslim, a Jew and a Christian how many Gods they believe in they would all answer "One God" but a Christian could continue on and give a more correct answer by saying that this One God is Three Persons whom we call: Father, Son and Holy Spirit. Jesus on the Cross on Calvary is the Tree of the Knowledge of Good and Evil (God’s Goodness and our evil) because by looking at Him on the Cross we learn more about God’s goodness and our evil. But it is not just in appearance but also because in the doctrine of the Trinity the Son of God is God’s infinite self Knowledge of His own Goodness. God’s self knowledge is a Fruit of His being which is why He is called the ‘Son of God’. Therefore Jesus literally is God’s divine Fruit of Knowledge of Goodness who was nailed to the Tree in order to redeem mankind. So just as apples hang on an apple tree so also God’s self knowledge of His Goodness hung on the Tree on Calvary. Jesus on the Cross is also the Tree of Life because by His death He bought our eternal Life. Jesus is the Fruit of Eternal Life. In the Book of Genesis Adam and Eve were refused access to eat the fruit from the Tree of Life but since redemption by Jesus was perfectly done, that means that in our Christian faith we should now have access to eat the Fruit of Eternal Life. Jesus is the Fruit of Eternal Life and as Catholics we believe that He gives Himself to us in the Mass. At the Last Supper Jesus said: “Take and Eat”. The Eucharist is the ‘Bread of Life’ and the Fruit of Eternal Life. ‘Unless you eat the flesh of the Son of man and drink His blood you cannot have life in you’ John 6: 53. Adam and Eve were two sinless virgins before the Fall but they did not remain so and Jesus and Mary were two sinless virgins before and forever after the Redemption. 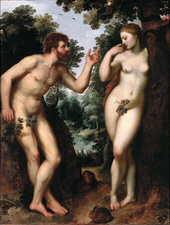 The Rosary meditations explore the many times where Jesus showed that He Is the New Adam and that Mary is the New Eve. Read more. . .